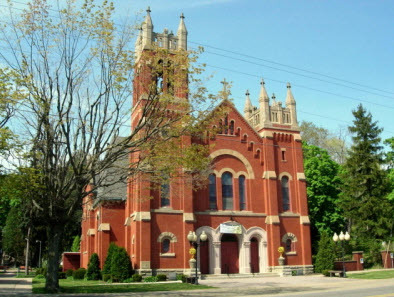 The Knapp family has a long history with St. Joseph Catholic Church located in the village of Randolph, Portage County, Ohio. In fact, our immigrant ancestor, Franz Adam KNAPP, donated the land where St. Joseph Church and Cemetery now stand. Mark and I had the opportunity during one of our visits to peek inside the church and we found a plaque commemorating Franz’s donation on one of the church’s walls. You can read more about the history of St. Joseph parish on their site, although no mention is made of Franz’s generosity on the website. To read an article about St. Joseph’s celebrating their 175th Anniversary in 2006, click this link. If you are ever in the area, the inside of the church is worth a look. Unlike a lot of older churches, it is bright and airy – not the least bit dark and dim. Obviously, the designer was way ahead of his time in making sure the sanctuary was a peaceful and sunny place to worship. The style is simple, but quite beautiful. But don’t take my word for it – you can click this link to St. Joseph’s photo album on their site to see pictures of the inside and outside of the church, the Lourdes Grotto Shrine and other photos. Click this link to see some photos of the beautiful old cemetery that lies next to and behind the church. There are many Knapp kin buried there. Just a few of the surnames of relatives you will find buried there include: Knapp, Trares, Paulus, Moledor/Molitor, Andes/Antes, Horning, Arehart, Mai/May, Schrader/Schroeder, and Wise. A fellow genealogical researcher, Mike Schwitzgebel, has generously shared some photos of St. Joseph tombstones on the U.S GenWeb Ohio Tombstone Project on the GenWeb site. Didn’t I tell you that genealogists are generous and helpful people? For those of you who aren’t genealogists, the U.S. GenWeb Project is devoted to making genealogical records FREE and available online for all researchers. I am planning to start photographing Knapp and Kline tombstones to upload to this page myself. But thanks to Mike, he has some of the family covered already. He has some photos of ANDES/ANTES tombstones. And Mark’s Aunt JoAnn may appreciate the photos of the GRIGGY/CRIQUI stones. By the way, here is a link to Mike’s site where you can find a lot of information about some of our common ancestors. I used the information on Mike’s site to track down a lot of family history. Stay tuned for a post about the Kline side of the family’s “home church,” St. Peter of the Fields located in Rootstown! This entry was posted in Family History, Local History, Maps and tagged Franz Adam Knapp, Knapp, Ohio, Portage County, Randolph, St. Joseph Catholic Church. Bookmark the permalink. I stumbled on your blog while googling. I’m glad to learn that my web site and the cemetery photos have been useful to you. Thanks for all your hard work and your willingness to share! That’s what makes genealogy such a great hobby!